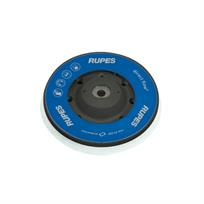 RUPES microfibre polishing pads are heavier than foam polishing pads and subsequently they have designed a special backing plate for use with these pads. This newly designed backing plate is lighter and this, combined with a repositioned centre of gravity ensures perfect machine balance when using with either the RUPES BigFoot LHR 12E 'Duetto' or LHR 15ES machines. The innovative ventilation characteristics combined with slots in the microfibre polishing pads effectively dissipate heat and maintain a cooler working surface temperature.